Grapes vines are popular for their fruit, which is used for a variety of purposes, including jellies, wines and sweets. Grape vines are also cultivated for their ornamental qualities in the home garden. Though they are robust growers, grape vines are susceptible to disease and require regular maintenance to prevent disease and insect infestation. According to Oregon State University Extension, planting healthy grapevine stock is the surest way to prevent disease in grape vines. Nonrooted cuttings that have been certified free of disease should be planted in your garden or vineyard. Clones and cultivars of disease-free grape-vine stock are acceptable too. Grape disease is often caused by infection by a fungus. Black rot, ripe rot and bitter rot are all caused by different fungus varieties, causing the fruit to decay. Foliar disease is fungal infection that causes grape leaves to crumble. Bacterial diseases, such as Pierce's disease, infect the vascular system of your grape vine. Vascular diseases are difficult to treat, often requiring that the vine be destroyed. Fungi, if left untreated, can ruin entire crops, but it is manageable. Preventive spraying of fungicide is the best method of control. Since fungi live and spread through soil, grape vines should not be planted in the diseased soil for ten years after removal of diseased plants. 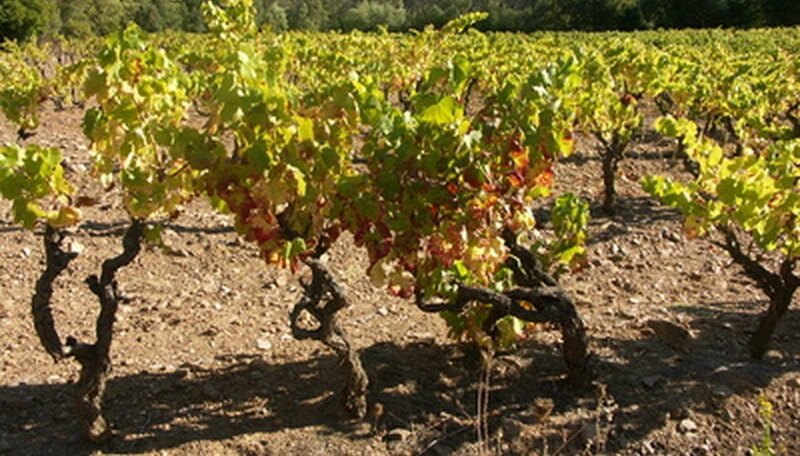 Dead and rotting portions of vine are susceptible to disease, which spreads rapidly. Removal of dead and rotting vines prevents the spread of infection. Regular vine pruning is most useful when done during the dormant season after severe weather has passed. Removal of all grapes from your vine will prevent disease spread by rotting fruit. And pruning your grape-vine canopy will improve air circulation in the plant, preventing the moist conditions fungi thrive in. Fertilization keeps grape vines healthy, making them less susceptible to disease. Grapes perform best when the soil pH is between 5.0 and 6.0. According to Ohio State University, 8 oz. of 10-10-10 fertilizer is required per grape vine after planting, and 1 lb. in the second year. Control of diseases require different sprays according to the disease and the area your grape vines are growing in. The first spray should be when plants are dormant, before new shoots appear. After new shoots begin appearing, when they are 1 to 2 inches long, another spray should be applied. This is repeated when the shoots are 6 to 10 inches long. A pre-bloom and post-bloom spray is applied after. Spraying is then repeated every two weeks.